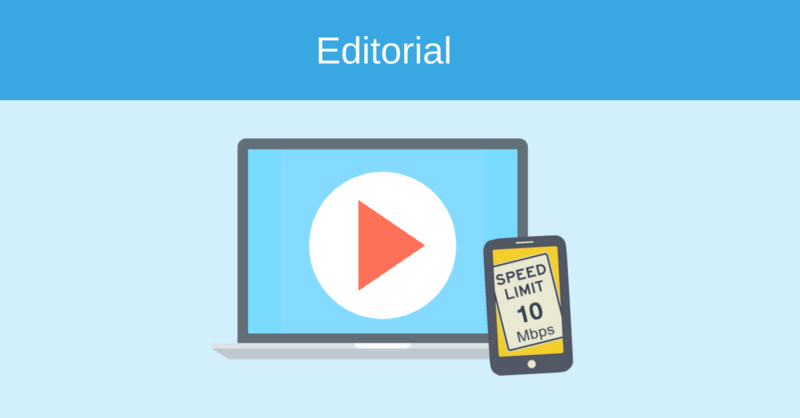 Last month, Verizon signaled that it might start throttling video streams by default when it conducted a brief test of a video optimization system that capped video speeds at 10Mbps. The latest development? Verizon introduced three new ‘unlimited’ plans on August 23, and its customers can’t watch 1080p video on their shiny new phones anymore. Verizon’s revival of the unlimited data plan in February of this year was excellent news: it was bringing back worry-free service that let customers use their smartphones as much as they liked. Users could do whatever they wanted with their phones until they reached 22GB of usage. At the time the carrier said that it would deliver video to customers at the same resolution used by streaming video companies. However, from August 23 Verizon is splitting out the relatively straightforward plan into three versions. These new ‘unlimited’ monthly plans are chock-full of fine print and caveats. For instance, the carrier is starting to throttle all video, with quality restricted to as little as 480p when watching on a smartphone. All of the plans include unlimited 4G LTE data, along with unlimited talk and text. The Beyond and Business plans also feature unlimited calls, texts and data in Canada and Mexico. The basic plan gives you unlimited hotspot access, but only at a pokey 600Kbps. In fact, if you use mobile hotspot for an hour, you can only download around 260MB of data — it’s that slow. The carrier will not be converting videos to lower resolution, but rather imposing a bandwidth limit so that streaming services adjust the quality accordingly. Verizon told Ars Technica: “We manage HD video throughput by setting speeds at no more than 10Mbps, which provides HD video at up to 1080p video.” The Mbps will presumably be lower than that in cases where Verizon limits video to 480p or 720p. The company professes that nobody can tell the difference between 720p and higher on a phone and 1080p and better on a tablet. However, that’s highly debatable when streaming videos on an iPhone and iPad. If you were looking for one bonus though, that comes via the extra 5GB of hotspot data that your Verizon Unlimited plan now has. Verizon’s single excuse for today’s changes is “We are offering choices on unlimited now because everyone deserves to experience unlimited on America’s best wireless network.” That reads suspiciously like avoiding the question. A better explanation is the data recently put out by two testing companies — OpenSignal and Ookla (the company behind Speedtest.net) — showing that Verizon’s average network speed has slowed since the introduction of unlimited data plans. That’s natural: The more people that are on any given mobile network all streaming HD-quality content, the worse everyone’s experience becomes. Other carriers have also taken to various restrictions to improve the conditions on their overcrowded networks. AT&T has two different unlimited data plans (“Unlimited Choice” and “Unlimited Plus”) with restrictions on video. While Sprint still allows 1080p video, it polices music streaming and gaming like no other carrier, in a way that practically feels draconian. T-Mobile limits video to 480p on its basic unlimited plan. However, T-Mobile doesn’t restrict everyday data speeds for apps and web browsing; it only slows down the connection after a user crosses 32GB in a month, which is generous compared to the competitors. While addressing overcrowding issues by limiting bandwidth is already problematic from the consumer point of view, it’s also possible that Verizon will eventually start offering unlimited, all-HD access to Unlimited customers who consume its own Oath> content. Such a Zero-Rating plan for Oath content would be a huge Net Neutrality red flag. Rolling back the net neutrality rules could open the door to many unfair practices like site blocking, throttling and preferential treatment for own content. It’s alarming that ISPs are already rolling some of these techniques out, even though the rules are still formally in place. What we see from these first attempts is an approaching race to the bottom in competition between networks, which is bad for everyone –– first of all broadband customers.